How I can turn on highilighting php code in org-mode structure block? ob-php is now in Org mode contrib and available through the org-plus-contrib package in Org ELPA. If you don't want all of contrib, then you'll have to grab ob-php directly from the Org mode Git repository (direct link) and load it yourself from your init file. With the current versions of php-mode and org-mode, PHP syntax highlighting in org code blocks happens by default. The version of org-mode in Emacs 26.1 includes this support. For earlier versions of Emacs you can install a newer version of org-mode from its ELPA repository. 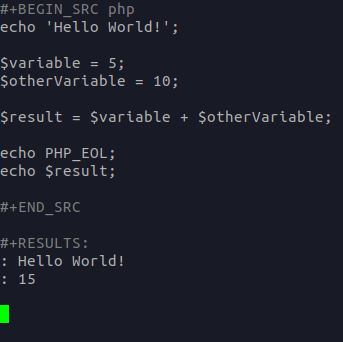 So if you have at least Emacs 26.1 for php highlighting in org-mode you need to just install php-mode. Not the answer you're looking for? Browse other questions tagged org-mode php-mode or ask your own question. How to indent with tabs in php-mode? How to indent php delimiter in php-mode? How to indent PHP code in PHP-mode?